It was my friend William that took me to the Russian wilderness. Well, actually, it was my students. Last November, local missionary William Wood visited his supporters in America and talked about his work in the northern Russian Komi Republic. After William shared with them, two students independently asked me if I would take them there on a short term missions trip this summer to visit. .
My response was: If you want to go reach the nations, I will do what I can to help make it happen. In the spring, William was found unconscious in his remote village. Meningitis, a coma& the news was very grave. Ever since, William has needed nurse care 24/7, first in a hospital, then hospice, and currently in his own apartment. Because of his health condition, it was decided that it would be best if the high schoolers remained home, but by then the die had been cast: I had made up my mind I was going to Russia. My travelling companion was Andrew Smith, 19 years old from the Bloomington area. Andrew had travelled to visit William last summer and I had invited him with me to return. We landed in Moscow on July 31st and were met by our host for our time there: Andre Kudinvov, who formerly served as William's interpreter and is now the pastor of the church William helped plant. From Moscow we flew to St. Petersburg and after a brief layover we found ourselves in Syktyvkar, a city of about 200,000 and is the capital of the Komi Republic. There, we had a chance to visit William. The nurses told us that he had been making improvements he cannot speak, but makes eye contact when spoken to. While William cannot get out of bed, he shifts his limbs from time to time, and the nurses say he shows good brain activity. When we were holding his hand he would squeeze it on command, which we took for a good sign. While in Skytyvkar, we had our first experience of Russian hospitality. The people we met were eager to try out their English with us and they were curious about American conditions and politics. Who will be the next American president? As in many other parts of the world, hospitality is huge. Time was frequently set aside to sit around the table and drink tea with various Russian snacks. The fellowship happened around the table, that's when we shared our lives, our stories, and got to know each other. Author Bob Goff once said Aim to be stunningly inefficient with your love. And that;s what it was. We weren't working, we weren't being productive, we weren't making money. We were simply spending time with one another. Someone once told me this accurate observation: Americans have the watches, the rest of the world has the time. which has given theologians and Bible scholars something to debate for centuries. much as America is considered a Christian nation. Russian Orthodox services are very traditional, with a portion of the service in Old Slavic. Andre shared with us that the Orthodox church in the Komi Republic had opposed the presence of William being there and helping people because William s Protestant beliefs were considered an American religion. 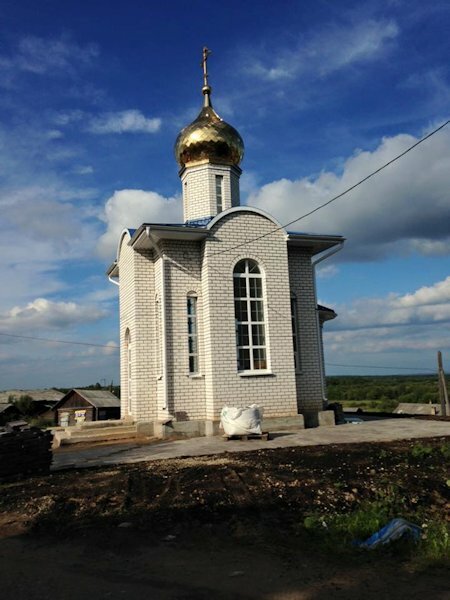 In fact, even though William's church is made up of entirely Russians, they are considered by some of the locals to be Americans because they worship and believe different things than they Russian Orthodox church. We were only in Syktyvkar a couple days before travelling on to the villages of Greva and Don. It would be in those towns my eyes would be truly opened. I would split firewood for the first time, learn about the mysterious banya, and spend hours fellowshipping with both kids and adults. But those, I believe, are stories for another time. A typical Russian Orthodox Chapel. 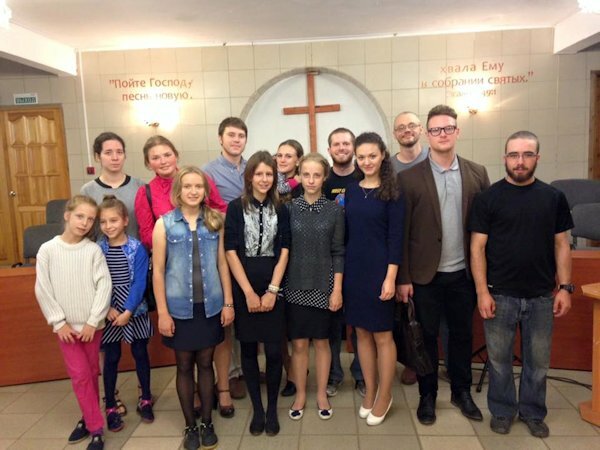 Justin Allaman, of the Rozetta area, in Russia, visits with youth. He's in back just right of the cross.